Ernesto "Che" Guevara (born June 14, 1928, executed October 9th, 1967) was a Marxist guerrilla leader, with Fidel Castro, during the Cuban Revolution. He has become a cultural icon for liberals, leftists, socialists, communists, illegal aliens, and white "hipsters". He also acted as an executioner of Castro, rallying up a massive body count, although he himself was easily cowed by anyone with guns even when he himself was armed. Despite being a terrorist, his image is still used as leftist propaganda which adorns millions of T-shirts and dorm room posters. "Ernesto Guevara failed spectacularly at everything he attempted in his life--except at the mass-murder of defenseless men and boys." Guevara was the eldest of five children born in Rosario, Argentina. His schoolmates nicknamed him "pig" (Chancho) because he rarely bathed, and smelled bad. He also enjoyed killing dogs. In 1955, while living as a hobo, Guevara met Raul and Fidel Castro to plot the overthrow of the US-backed Fulgencio Batista government in Cuba. Their first revolutionary plan was an assault on Cuba from Mexico. During the war, Castro promoted Guevara to commander status, and Guevara won the Battle of Santa Clara. This defeated Batista's forces and allowed the bearded guerrillas to march on towards Havana. On New Year's Eve 1958, Batista's forces were defeated and on New Year's Day, Batista fled to the Dominican Republic. Castro and Guevara became Cuba's new socialist revolutionary leaders. Guevara killed many thousand people, who were "enemies of the revolution". Those "enemies" were Homosexuals, dissidents or AIDS-infected people. Guevara was appointed commander of the La Cabaña Fortress prison. He oversaw the trial and execution of many former Batista regime officials. Roberto Martin-Perez was imprisoned for 30 years in Castro's dungeon prison. Roberto says "Castro ordered mass murder ... in order to consolidate his power." Guevara, as Castro's chief executioner, relished the slaughter of defenseless men and boys. Guevara became feared for his brutality and ruthlessness. During the 1961 Bay of Pigs invasion, Castro ordered Guevara to take up a command post in Western Cuba. He never saw any fighting and did not participate in the Cuban victory. However, he dropped his pistol and shot himself in the face. Guevara was the main proponent of missiles in Cuba and urged Khrushchev to nuke the United States. In December 1964, he gave a speech before the U.N. General Assembly mocking the "imperialism" of the USA, and also freely admitting that he killed and will continue to kill "enemies of the revolution." The number of executions he ordered is unknown, with conservative estimates ranging from 400 to 2,000 over his lifetime. Unfortunately, lack of records mean that the exact number will probably never be known. Guayasamín, La Muerte del Che nº 2, 1978. 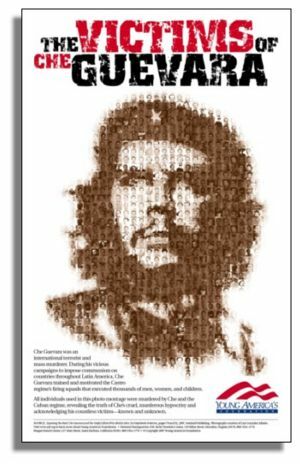 Guevara authored an insurgent booklet entitled Guerrilla Warfare. He left Cuba to lead a Communist guerrilla movement in South America. Bolivian soldiers, trained, equipped and guided by U.S. Green Beret and CIA operatives, hunted him down in the Bolivian jungle where he was captured. He cried out "Do not shoot! I am Che Guevara and worth more to you alive than dead." However, the U.S. and Bolivia knew better. He was executed by Mario Terán 2 days later, and his hands were chopped off and put into a jar. Because of the Soviet's all-time low popularity at the time, and by extension all of Communism, Che was immortalized by Castro by implementing a romantic version of Che as part of a propaganda campaign shortly after Che's death in Bolivia. One of the people instrumental in this campaign was French philosopher Jean-Paul Sartre, who himself was a Communist in bed with the KGB, having referred to Che Guevara as "the most complete human being of our time." Ion Mihai Pacepa had heard of the propaganda campaign back when he was still serving the Romanian communist party. As such, alongside Chinese dictator and mass-murderer Mao Zedong, Che's image has (ironically enough) been used for merchandising. "At the risk of seeming ridiculous, let me say that the true revolutionary is guided by a great feeling of love. It is impossible to think of a genuine revolutionary lacking this quality." "In capitalist society individuals are controlled by a pitiless law usually beyond their comprehension. The alienated human specimen is tied to society as a whole by an invisible umbilical cord: the law of value. This law acts upon all aspects of one's life, shaping its course and destiny. The difficult thing for someone not living the experience of the revolution to understand is this close dialectical unity between the individual and the mass, in which the mass, as an aggregate of individuals, is interconnected with its leaders." "Instead they must dedicate themselves to study, work and military service! Youth should learn to think and act as a mass. It is criminal to think of individuals! Individualism must disappear from Cuba!" Che Guevara and the Useful Idiots Who Idolize Him, Humberto Fontova. ↑ Reiland, Ralph R. (August 12, 2018). Che Guevara: Romanticizing Tyranny. The New American. Retrieved August 12, 2018. This page was last modified on 9 April 2019, at 01:32. This page has been accessed 72,992 times.